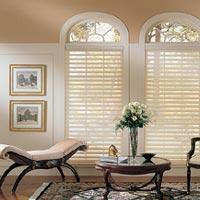 We clean almost all kinds of soft blinds and shades. We will take them down and rehang them if necessary or you can bring them in to our plant for cleaning. Some types can be cleaned while hanging in your home while others must be brought in to the plant for processing. Results are generally very good to excellent with the exception of a couple of recurring problems. Fabric shades such as roman or austrian shades that have gone too long between cleanings will get a yellow "sunburn" line in the areas most exposed to light or heat. These can't always be removed completely. Also pleated honecomb style or "Z" style blinds that have been exposed to soot or excessive carbon (such as from candle burning) will be almost impossible to get clean. In cases where there is any question as to the results, we will generally do a free test cleaning at your request. Set up an appointment for a free inspection and estimate. Call us today at 512-327-7553 for your free, written estimate. For aluminum, vinyl or wood blinds we suggest that you call Frank Severn with On Site blind cleaners at 512-918-3333.